Sorry, wrong Margherita. This is the pizza variety and made straight from the garden. 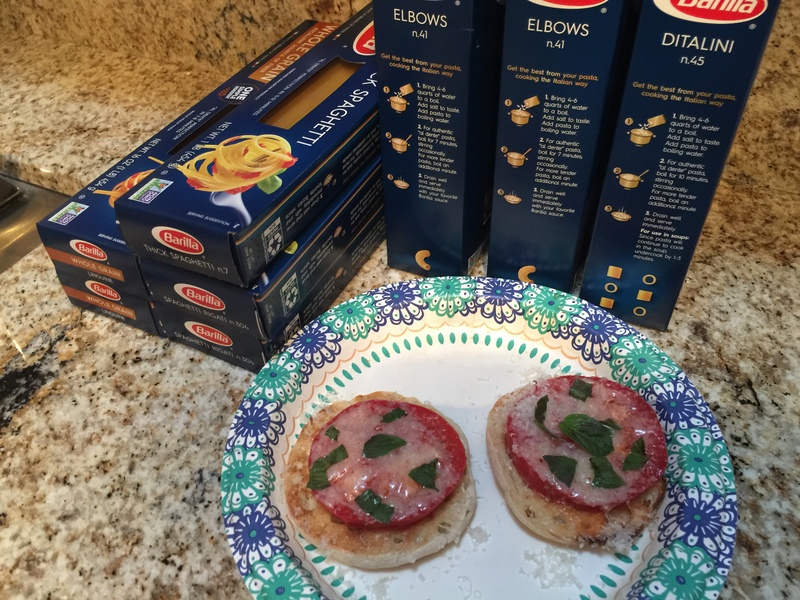 A toasted English muffin, a couple of slices from our daughter’s bounty of tomatoes, Parmesan cheese, basil from the backyard, and a sprinkling of kosher salt and that is a tasty breakfast. It probably would be best to broil the top but I am lazy and just stick it in the microwave for 30 seconds to melt the cheese. For dinner, a vegan favorite packed with lots of healthy veg and chickpeas. I made a ton of this soupy stew today so we can be eating it for dinner tonight and for lunch a couple of days. Sauté onions, carrots and celery, add some hot pepper flakes and salt while that is cooking, next add garlic, a bunch of cherry tomatoes (yellow ones from our daughter’s garden but using petite diced from a can is okay too), some optional zucchini, and the rinsed, canned chickpeas. Then pour in some vegetable stock (or chicken stock for a non-vegan alternative) to cover and bring it to a boil. Add a small pasta like ditalini or orzo and cook until al dente. You may need to add some water to make sure that there is enough liquid to boil the pasta. Final step, stir in and wilt some greens and adjust the seasoning. I top mine with just parsley but John likes to use some good finishing oil along with the parsley and a grating of Parmesan cheese. 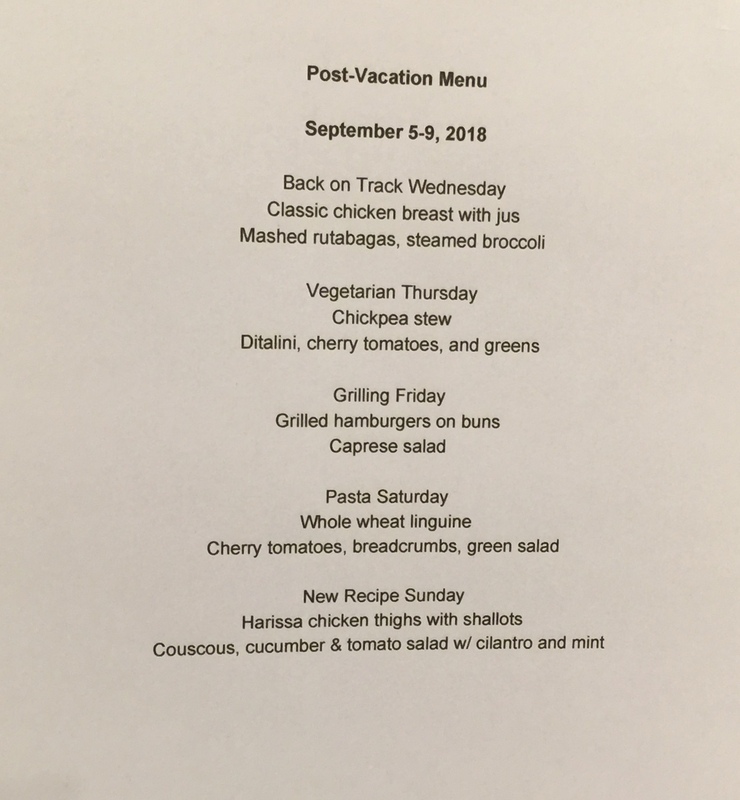 Finally here is the menu for our post-vacation rest of the week. It only goes until Sunday since you know I like to begin my week on Monday. 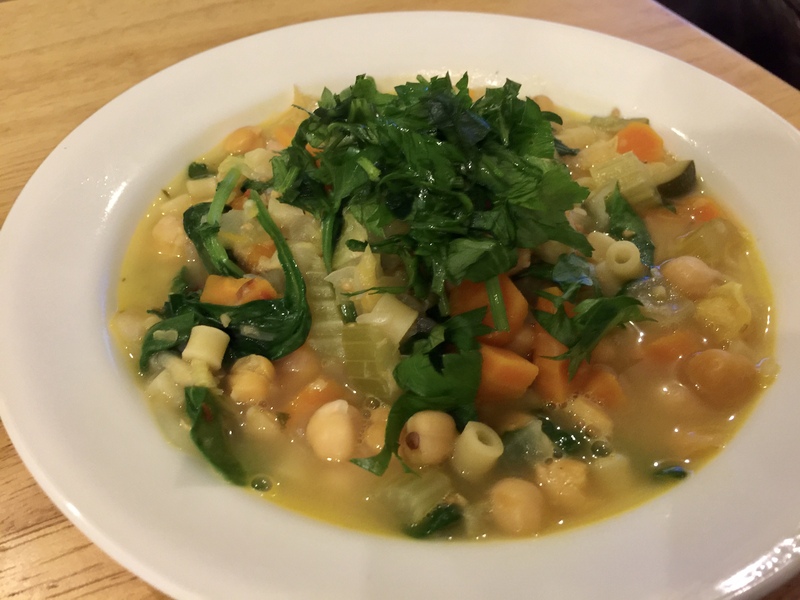 This entry was posted in Legumes, Pasta, Recipes, Vegan, Vegetables, Vegetarian and tagged carrots, Celery, chickpeas, ditalini, garlic, Onions, tomatoes, Vegan, Vegetables, vegetarian, zucchini. Bookmark the permalink.